HOT! Home Depot Christmas Light Trade-In Program for High Value Discount! HOT! 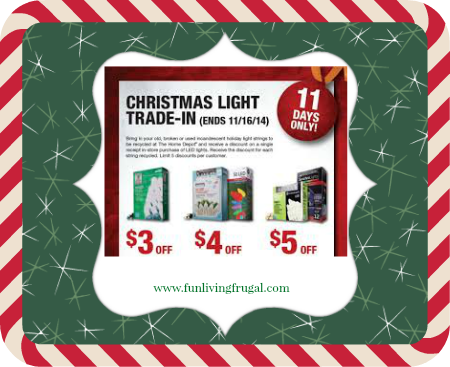 Christmas Light Deal through the Home Depot Christmas Light Trade-In Program through 11/16/14. Back for 2014, Home Depot is offering you a high value discount just for recycling your old or broken Christmas lights. Trade in your old, used or broken incandescent holiday light strings to be recycled at The Home Depot and receive a discount on a single receipt in-store purchase of LED lights. Receive the discount for each string recycled. Limit 5 discounts per customer! ~ $5 Off EcoSmart or LED Lightshow LED Lights. Previous post$2 in FREE CVS ExtraBucks! Next post5 FUN Family Christmas Lights Events in Dallas / Ft. Worth!